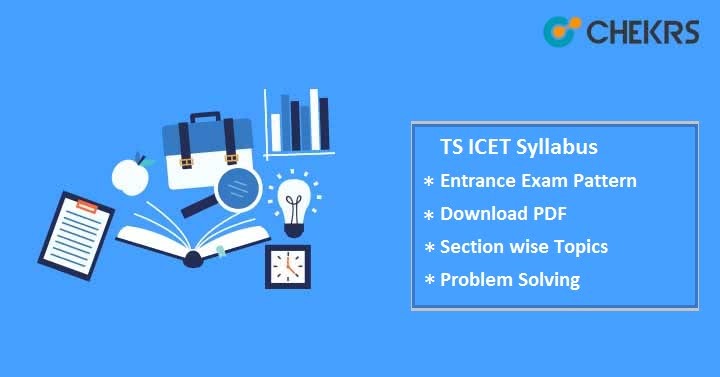 TS ICET Syllabus 2019 Pdf Download: Candidates keen to take admission in to MBA and MCA programmes in Kakatiya University, Warangal and their affiliated colleges can apply for TS ICET 2019. TS ICET is an entrance exam conducted by Kakatiya University, Warangal on the behalf of Telangana State Council for Higher Education (TSCHE). If you are thinking to appear in this exam, then you should collect all the study materials to start the exam preparation. To qualify the exam with good marks, one should follow the Telangana ICET Syllabus along with TS ICET Entrance Exam Pattern. The syllabus will comprise of 3 sections i.e. Analytical Ability and Reading Comprehension, Mathematical Ability and Communication Ability. Here we have brought to you Section wise Syllabus containing all topics from where questions are likely to come. Candidates can also download the officially prescribed Syllabus in PDF format from here. It will help you to get familiar with each and every topic that is important from exam perspective. The exam pattern gives you exact idea of examination and paper such as exam duration, marking system, distribution of questions in each section, mode of examination etc. Candidates should check the Telangana ICET Exam Pattern before appearing for the exam so that you would not get confused on the examination day. Here we have shared the TS ICET Entrance Exam Pattern to help aspirants to score good marks in the entrance exam. To known the current question pattern which is in trend and the difficulty level of paper, you can check TS ICET Sample Papers. Candidates are advised that after completing the examination course practice the Previous Year Question Papers on a regular basis for improving speed and accuracy. I hope the details provided by us are sufficient and useful for the viewers. Keep in touch with our site to get the latest updates. To ask query, drop the questions in the comment section below. Best Wishes!! !